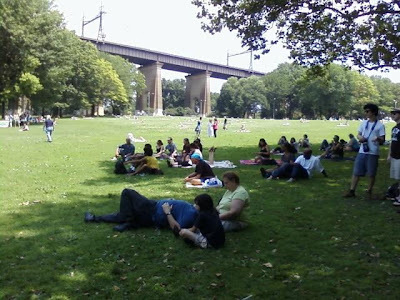 This afternoon we took the G, 7 and N trains and then walked longer than we expected to the lovely Astoria Park, on the water between the RFK/Triboro and Hell Gate bridges, for Astoria Music Now!, the second annual festival sponsored by Astoria Music & Arts. We stayed a few hours and had a good time. 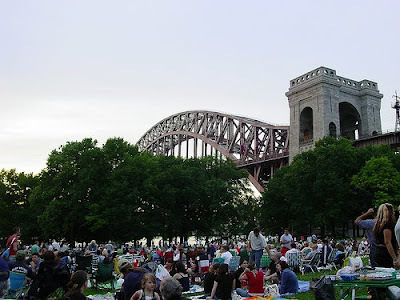 Justin Finley, the festival founder and creative director, said that its intent is to celebrate and maybe give a much-needed leg up to Astoria's energetic music scene. 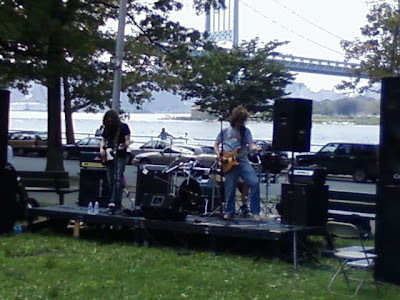 "There are tons of musicians living in Astoria," Finley told the Daily News. "But the model has always been that you have to go into Manhattan or Brooklyn to play. 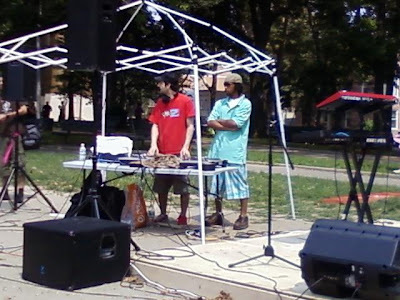 We and a bunch of other people are trying to celebrate our own local music scene." 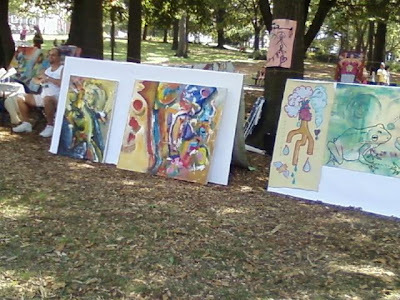 There were four stages for bands from noon going till 9 p.m., arts and crafts vendors, a young woman ("Love Girl") in a weird but fetching outfit selling smoothies, an art wall featuring work by Ben Louria, Jenna Newton, Vicky Barranguet, Betty T. Kao, and a bunch of other stuff. 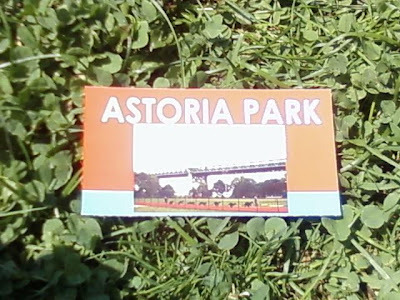 Astoria Park is really gorgeous; this was our first time there, and the big surprise was how big it is. 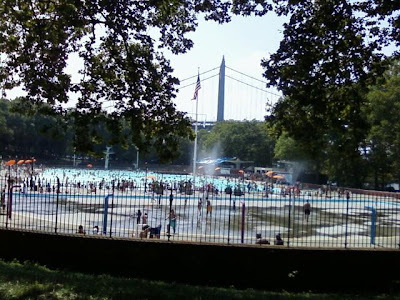 And to those of us from Williamsburg, another big surprise is that their pool actually contains some water - and lots of happy people cooling off. 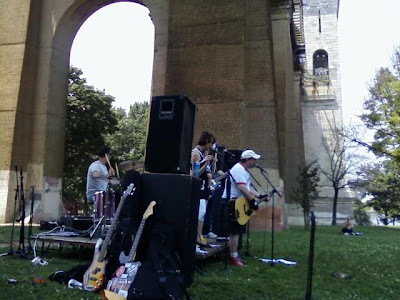 At the Hell Gate Social Stage under the Hell Gate Bridge, we saw Bob Muir and the Enemy Below, who play the kind of depressing ballads that make those men so inclined (definitely not us) want to kill themselves when they hear them at 2 a.m. when they're driving home from a bar after striking out again with some women. Their songs are whimsical and we liked the band's lack of pretension. At the Quays Shore Stage we saw Matthew Snow & The Way It Was Is A Dream. Matthew is from Akron and pays too much for his apartment in Astoria. Following them we caught Stone Robot, an indie/garage/alternative rock band influenced by space, nature and robots. We were most impressed with Lisa Bianco, who also was working like a mofo in the role of stage organizer, not for organizing skills, but for her exceptionally fine music. The Village Voice called her work "galvanizing" and the East Coast Rocker called it "an interesting blend of alternative, guitar rock, and pure punk aggression." We were actually headed in the other direction when we heard her first song, which was so mesmerizing that we turned on our heels (well, as best we could with plantar fasciitis) and went over to hear her whole set up close at the acoustic General Slocum stage. "Postdata," from the album by the same name, was especially fine. 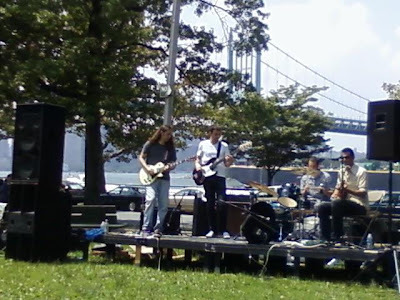 We saw some other good local bands and solo players and listened to pretty good DJs at the Lucky Mojo's Triboro stage by 19th Street before we walked down a block to catch the Q69 bus down 21st Street to the last stop by the Court Square G train terminus. 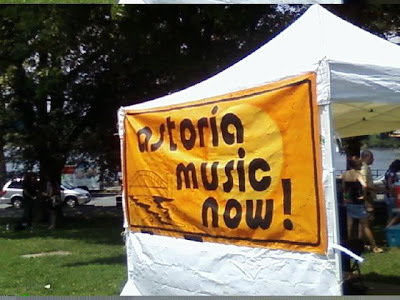 Astoria Arts & Music did a great job on the festival, and you know, Astoria Park and the whole wonderful neighborhood (when we were growing up in the '50s and '60s, it was as close to Greece as we ever got) is really not very far from Greenpoint and Williamsburg. We go there once in a while, but not as often as we should. hey there! this is audrey, i work with astoria music & arts. 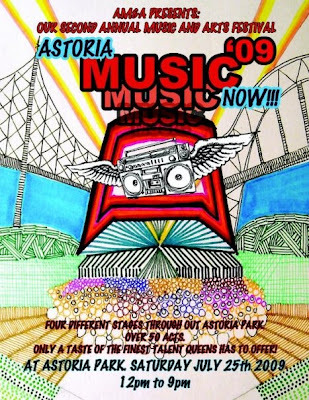 i just wanted to thank you so much for your great post & pix about our astoria music now! festival! 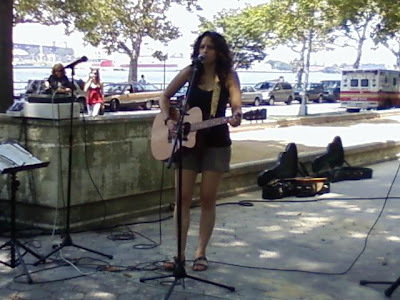 i added your link to the press page on our wordpress site (astoriamusicarts.wordpress.com) -- hope you don't mind. thanks so much for coming out & we're so glad you enjoyed yourself! hope you'll come out to future events. cheers! Seize Them! had a great time playing the fest. Thanks for coming by! Hi - glad you liked the band - we didn't do our shall we say edgier material because there were children about and we have some standards - not many true but some. bob muir & the enemy below. CHROMA and FANZINE review "LIfe As We Show It"